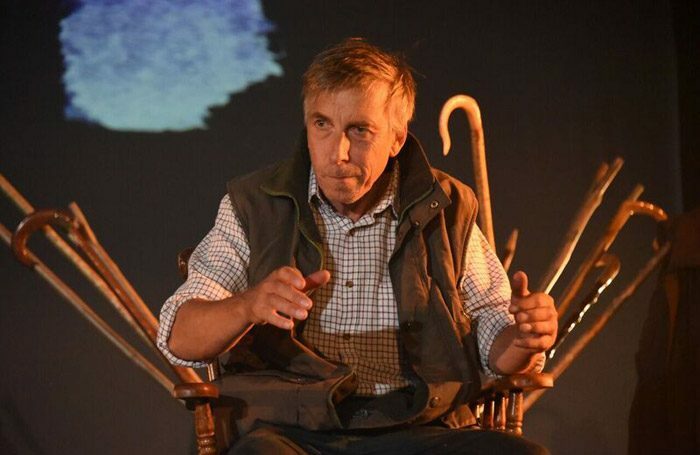 National Theatre Wales’ The Stick-Maker Tales is one of five monologues – Love Letters to the NHS – each performed in different parts of Wales to commemorate the health service’s 70th anniversary. We meet Gethin, a dogged but genial sheep farmer who’s spent a lifetime tending his flock on the hills above the Elan Valley. He’s proudly independent, used to making do without handouts (“I’ve paid my stamp,” he says obstinately). So, when he notices his eyesight failing him, Gethin believes the end is coming. Llion Williams delivers a performance layered with humour, pathos, and stubbornness. Kully Thiarai’s direction is deliberately unobtrusive – while lighting and sound skilfully hint at the impending darkness, and Jennifer Lee’s handcrafted set harks to a simpler time, there are, rightly, few theatrical tricks. Peter Cox’s well-observed script is set a stone’s throw from the Pavilion theatre. Gethin is the ageing farmer the audience all knows from local markets, happy to spin a yarn given the opportunity. Each story of stoicism, though, tends to blur into the next, while other aspects of Gethin’s life – why he never married, for example – are skirted over, when the monologue form should allow us a glimpse behind the tough exterior. It becomes clear that Gethin’s life has been indelibly affected by the NHS and will be better for it. His wish to be remembered as the man who cared for the whole flock, not just one or two lambs, serves as a fitting allegory for the service.